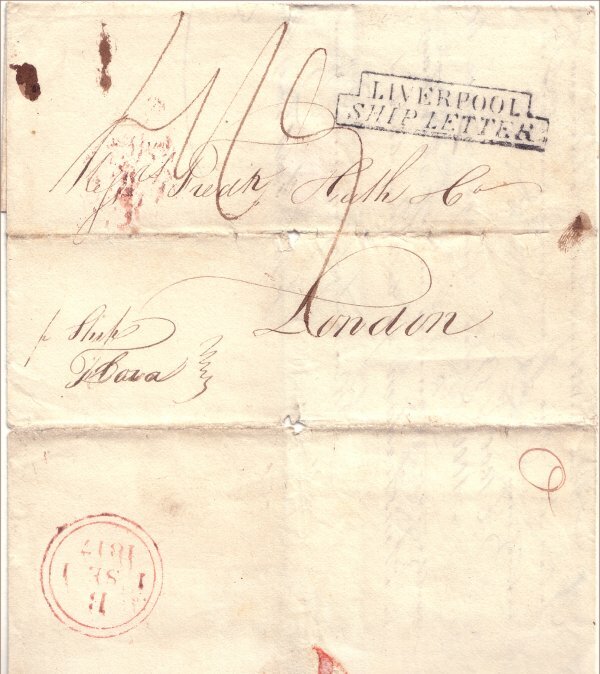 Triple rate entire sent from New York via Liverpool to London in July 1817. Ship Mark: 'LIVERPOOL / SHIP LETTER' Tabeart type S8, in use 1817-1832. The GB ship fee of 8d per rate increment plus inland mileage applied from 11th July 1815 to 10th January 1840. The internal mileage charge applied from 9th July 1812 to 5th December 1839. United Kingdom Letter Rates, Inland and Overseas, 1635 to 1900, Colin Tabeart.